Sugar-Free Paleo Cinnamon Applesauce– A great side dish for the next time you make pork chops, our sugar-free cinnamon applesauce is just what you’d expect, smooth texture, plenty of apple flavor that’s best served cold. 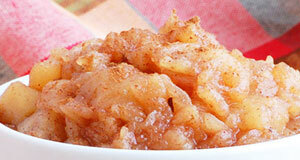 Just the right amount of cinnamon is added so you don’t have to doctor it up. Sweet Potato Tater Tots with Homemade Ketchup– You don’t have to give up your favorites with Paleo, just make the adjustments so you can still have what you want. 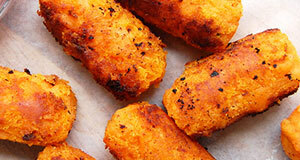 Our sweet potato tater tots give you the look and feel of regular tots without the need for white potatoes. 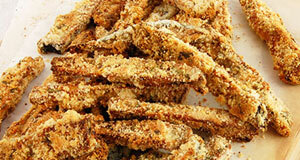 Baked Eggplant Fries with Rosemary and Thyme– Get the French fry experience with these baked eggplant fries seasoned with rosemary and thyme. The eggplant bakes up to a nice texture that mimics what you get from potatoes, while keeping you totally in line with Paleo requirements. Grilled Veggie Salad Platter with Lime Sauce– Enjoy a range of flavors when you grill up this veggie salad platter that comes with its own lime sauce. You’ll love sampling the different vegetables and this makes a great side dish for just about any meat dish, including fish. 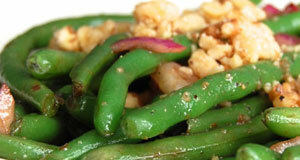 Balsamic Green Bean Salad– Serve up a side of these balsamic green beans and you’ll have your vegetable bases covered. They’re so tasty they may even steal the show. 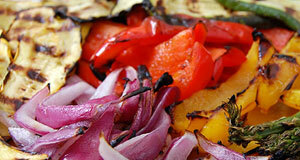 Always remember to supplement your meat dishes with a veggie for a balanced meal. 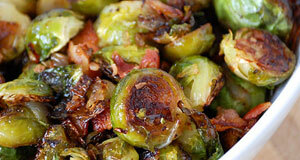 Perfectly Roasted Brussels Sprouts with Bacon– Brussels sprouts get the bacon treatment in this side dish creation. And bacon is just the thing to make this childhood nemesis a new favorite veggie. 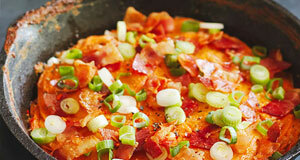 You just can’t beat the savory flavor added by the bacon when it comes to taste. 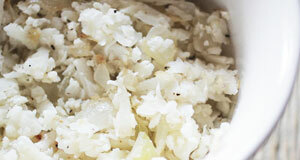 Paleo Cauliflower “Rice”– Here’s a great side dish that goes with nearly everything and is something that you can use in a variety of meals. It replaces the high carbs that come from regular white rice and replaces it with a cruciferous vegetable for better health. 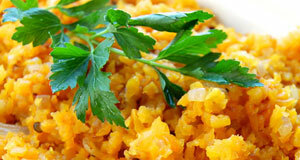 Healthy Butternut Squash “Risotto”– Instead of lamenting that you can no longer have risotto, make this recipe which uses butternut squash to keep it entirely Paleo. The soft texture of the squash imitates closely the mouthfeel of traditional risotto, and sneaks in a serving of vegetables. 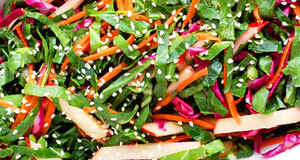 Collard Green Paleo Slaw (Super Slaw)– This super slaw takes coleslaw to the next level. It’s made with collard greens, which are also in the cruciferous vegetable family along with cabbage. This means you’re getting a double dose of the good stuff in terms of health-promoting nutrients. Paleo Guacamole 3 Ways (Classic, Sweet & Spicy)– Here are three different ways to enjoy guacamole that’s completely Paleo friendly. 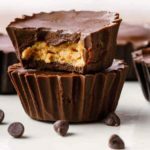 There’s a classic recipe to keep things original, as well as a sweet version to tantalize your sweet tooth, and a spicy option for those that like the heat. Simple Homemade Paleo Coleslaw– Here’s a classic coleslaw recipe that’s been revamped so it’s perfectly Paleo. It uses a generous portion of cabbage, including two different types. 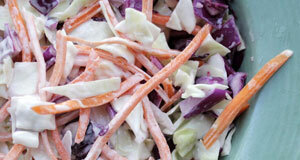 It produces a creamy coleslaw without the need for any dairy and still feels like a traditional slaw. 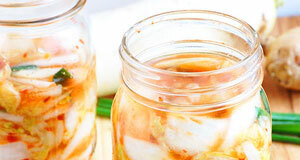 Homemade Spicy Paleo Kimchi– Kimchi is a great fermented vegetable to help stimulate your inner bacteria and can help lead to better digestion. Take a walk on the spicy side with our Paleo kimchi that will bring the heat and get your stomach ready to digest your meal. 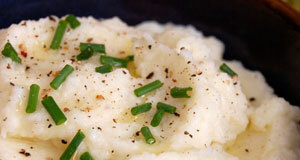 Easy Mashed Cauliflower with Garlic– You’ll never miss mashed potatoes when you have our mashed cauliflower with garlic on hand. 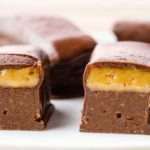 It’s the sort of recipe that makes Paleo so easy to follow. Fluffy in texture and with the same visual appeal as a serving of mashed potatoes. 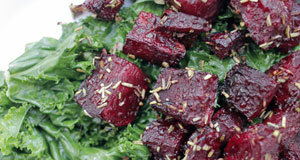 Rosemary Beets with Garlicky Kale– Beets are so incredibly healthy for you that you simply must add them to your Paleo plan. If you don’t like the taste of pickled beets give these rosemary beets a try. They’re made from fresh beetroot and are accompanied by a garlic-heavy kale. 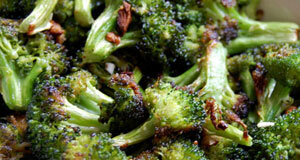 Garlic Roasted Broccoli– Garlic helps the broccoli in the flavor department and this is a recipe that’s best suited for garlic lovers. It’s roasted to perfection so the broccoli is soft but not mushy, and it’s the sort of side dish you can have again and again without getting bored with it. Honey Balsamic Roasted Brussels Sprouts– These Brussels sprouts are loaded with flavor thanks to the use of a combination of honey and balsamic vinegar. This is a nice duo of sweet and tart and the Brussels sprouts merely serve as a backdrop so it’s great for those that don’t really like their flavor. Roasted Butternut Squash and Onions– This butternut squash recipes is destined to make it onto your weekly lineup of side dishes. 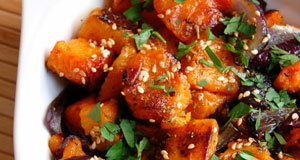 The soft texture of the squash goes well with the onions, and the roasting process makes everything taste better. Supporting ingredients add to the flavor and nutrient content. Balsamic Roasted Cauliflower– Getting more cruciferous vegetables into your life is easy when you have a delicious recipe like this available. 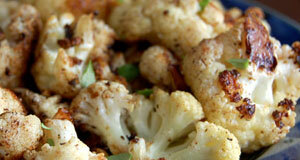 Roasting the cauliflower brings out its flavor and makes it a treat rather than a chore to eat. Balsamic vinegar is soaked up and delivered to your taste buds. Butternut Squash Gratin with Creamy Cauliflower Sauce– If you’re cooking chicken or beef you can’t miss with this butternut squash gratin recipe. It’s everything you love about potatoes au gratin without the need for potatoes. It comes with its’ own creamy sauce made from cauliflower. 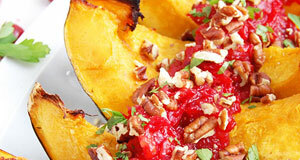 Roasted Acorn Squash with Cranberry Sauce– This recipe gets high marks for its presentation, and you’ll love the way the cranberry sauce goes with the acorn squash. 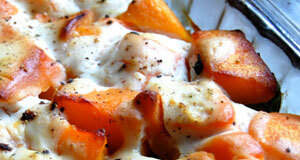 The roasting process makes the squash taste amazing and gives it the right texture, fully cooked and not mushy or hard. 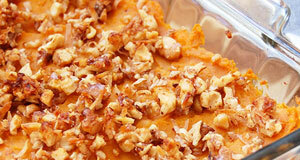 Sweet Potato Paleo Casserole– You can bake up this sweet potato casserole and have a beautiful side dish that everyone will love. This works as a Thanksgiving side too, but can be used throughout the year as the perfect side dish that blends sweet and savory together. 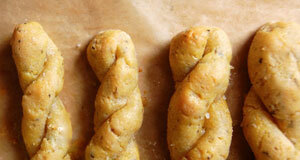 Paleo Garlic Breadsticks– Get hooked on our garlic breadsticks and you likely won’t have an Italian meal without them again. 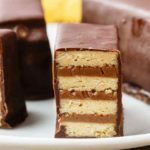 They’re just that good, and will prove everyone wrong that thinks you can’t have bread or anything bread-like with Paleo. Delicious & Healthy Cauliflower Tabbouleh– Traditional tabbouleh would be a no-go on Paleo because the bulgur it’s made from comes from wheat. 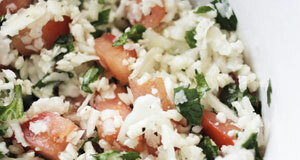 Our tabbouleh is made from cauliflower and is a healthier alternative. 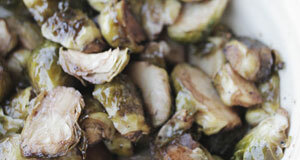 A perfect side dish to chicken, fish, or a beef dish to balance it out. 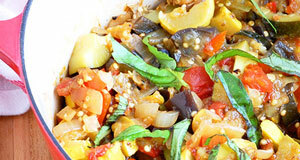 Classic Ratatouille– Make our classic ratatouille and you’ll have a delectable mix of healthy vegetables cooked to perfection. It makes eating vegetables easy and tasty and you’ll be blown away by how easy it is to make a restaurant-caliber side dish. 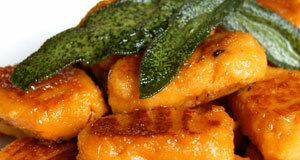 Yummy Sweet Potato Gnocchi– Have you given up your gnocchi because of Paleo? No need to when you make ours out of sweet potatoes. They have much of the same flavor but provide you with the fiber and antioxidants of sweet potatoes for healthy benefits. Bacon-Wrapped Roasted Asparagus– Asparagus makes the perfect side dish when you’re having salmon or other fish, and also makes a great choice alongside chicken or beef. 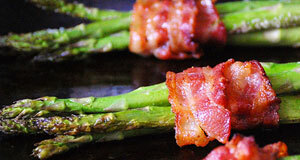 Here asparagus gets an upgrade by being wrapped up in savory bacon for tons more flavor. 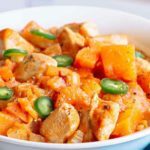 Scalloped Sweet Potatoes– Give these scalloped sweet potatoes a try the next time you need a delicious side dish that provides antioxidants and fiber along with big-time taste. 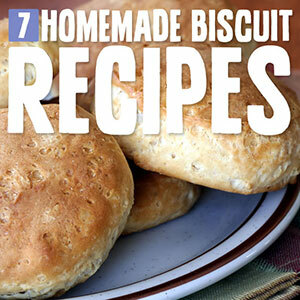 7 Homemade Gluten-Free Biscuits– There are few meals out there that wouldn’t be better with a biscuit. Make them the gluten-free way with our collection of seven different biscuits all made to Paleo standards. No grains at all, just amazing biscuit flavor and texture. 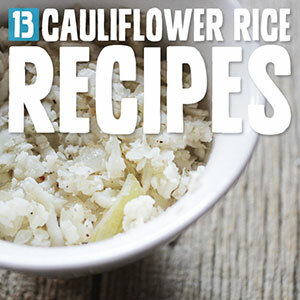 13 Delicious & Wholesome Cauliflower Rice Recipes– Cauliflower rice makes a great side choice for a plethora of different meals, and you can find over a dozen ways to make it to keep it interesting. Find just the right recipe that goes with what you’re making and you’ll have a more complete meal. 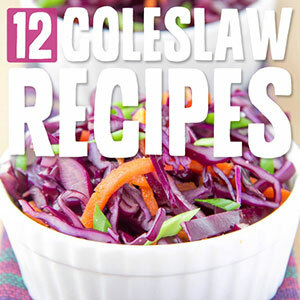 12 Homemade Paleo Coleslaw Recipes– Be the star at the next picnic or barbecue when you make a Paleo coleslaw that’s a crowd pleaser. It’s all about using fresh cabbage and other veggies to bring the right flavor and texture and getting rid of any dairy or sugar. 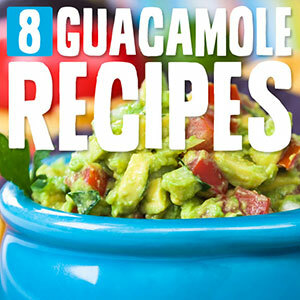 8 Incredible Paleo Guacamole Recipes– Guacamole should be Paleo friendly when made the traditional way, but these Paleo chefs have taken it to a new level. 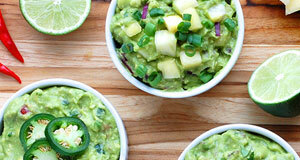 See just how many different ways you can turn simple avocados into something even better. 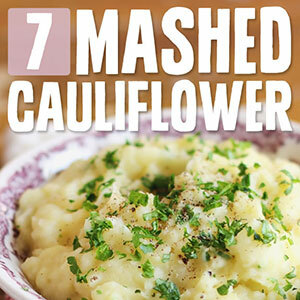 7 Comforting Mashed Cauliflower Recipes– Mashed potatoes get the boot when you make any of these mashed cauliflower recipes. No white potatoes needed when you have a delicious cruciferous vegetable waiting to take over the reigns. Try in place of mashed potatoes at any meal. 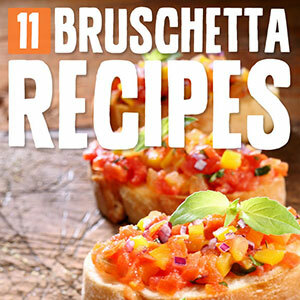 11 Unique Paleo Bruschetta Recipes– Bruschetta can be a nice Paleo side dish that hits the spot when you’re having chicken or other meats. These recipes show you how to take Paleo friendly bread and add toppings to it so it tastes even better than it did before. 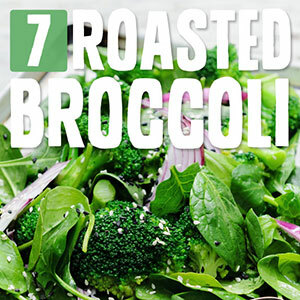 7 Addicting Oven Roasted Broccoli Recipes– Roasting broccoli to perfection is part art form, and these recipes show you just how good broccoli can be. Fill your home with the awesome aroma of roasting broccoli and let the countdown to mealtime begin. 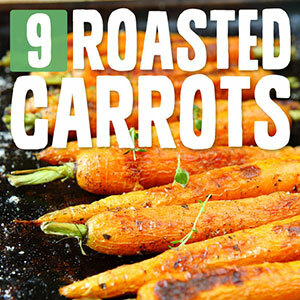 9 Unbelievable Roasted Carrots– Carrots reach their full potential when they’re roasted, and you’ll love the way these recipes taste. 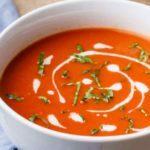 Put them next to a pot roast or a chicken dish and you’ll have a complete meal that will provide you with extra fiber and beta-Carotene. 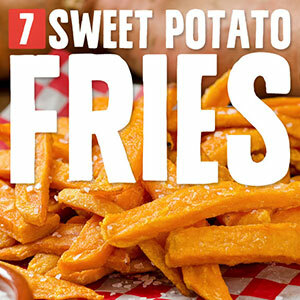 7 Paleo Sweet Potato Fries– French fries are no longer needed when you have these amazing sweet potato fries at the ready. Choose from seven different recipes and you won’t be disappointed as they each use a different path to get you to french fry nirvana.